Our stunning, fully-furnished suites are designed to help you maintain your discerning lifestyle yet receive all the care and support that you may require. All suites include a smart flat screen TV, microwave, fridge, nurse call buzzer, built-in robe and large ensuite. 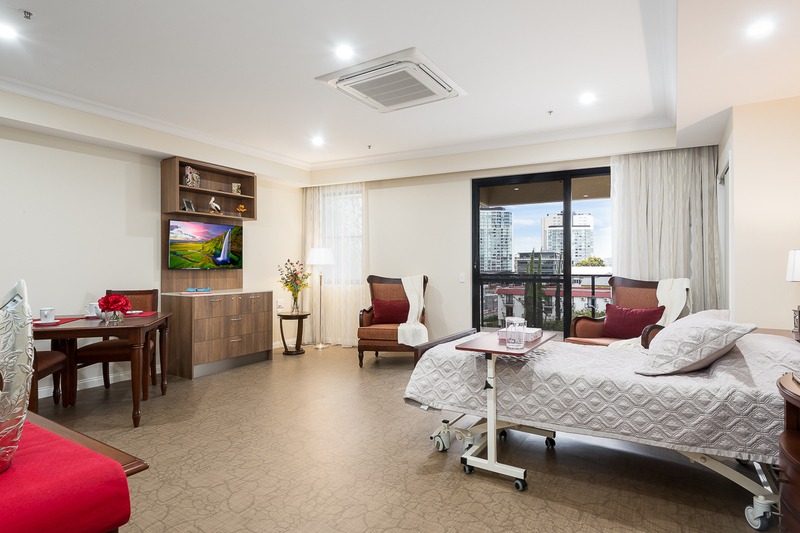 Our Aged Care Suites also includes a 15 bed Specialist Care Suite (SCS) for those with memory support requirements. Portofino boasts beautifully-appointed three and four-bedroom apartments, and four (three/four bedroom) penthouses on the sixth floor. All apartments feature spacious rooms and luxury finishes. There’s also a pool, gymnasium and club room to support those with an active lifestyle and we offer a range of premium wellbeing and lifestyle options. We understand your health care needs and level of independence may change over time. That is why at Portofino, you are able to stay in your own apartment and receive a high level of personalised nursing care. See more information by visiting the portofinohamilton.com.au website or by viewing the virtual tour here. Portofino’s Classic Specialist Care Suite is a single room and includes your own private ensuite and kitchenette. These suites are large in size (23m2 - 27m2) in a secure environment, providing peace of mind and safety. Residents also have full access to a protected outdoor area including activities room. Take in the views of the surrounding vista from your large (24m2 - 31m2) Superior Suite on Levels 1 and 2. with your own personal kitchenette. The suite includes a personal kitchenette and expansive 6m2 bathroom with beautiful tiles and quality fittings. Choose from two configurations of the Grand Deluxe Specialist Care Suites. The first style is a large room (23m2 – 26m2) in the quiet end of the unit and the second is a very large room (26m2 – 27m2). All suites are single rooms and includes your own private ensuite and kitchenette. Residents have full access to a secure outdoor area and activities room. The large (23m2 – 31m2) Grand Deluxe Suites are located on Levels 1 and 2 with their own private ensuite and kitchenette. All Grand Deluxe Suites have direct access to the communal balconies with some rooms having their own semi private balcony which is shared with a limited number of suites. With an average size of 29.4m2 our Imperial Suites are very large rooms (24m2 – 31m2) located on Levels 1 and 2. Enjoy the additional seclusion on your semi-private balcony which is only shared with a maximum of three other units. Included is a good sized ensuite and personal kitchenette. Our Executive Suites are very large suites (42m2 – 48m2) and have great views from Level 3. Each has a plush single ensuite, great views, communal balcony access and your own kitchenette. Please note - one room has no balcony. The seven Signature Suites are located on Level 3. All are very large suites (42m2 – 52m2) with spacious single ensuites, personal kitchenette and semi-private balcony or terrace access. There is only one but, oh, what a room! Our Royal Suite resident will enjoy the expansive views from Level 3. In fact, choose your view from either of your two private balconies. At 54m2, this extra large room has a spacious ensuite and your own personal kitchenette. Portofino Hamilton has 26 spacious, two-three bedroom apartments on offer on Levels 1 to 3. The main bedroom has a generous ensuite and walk-in wardrobe. The second or third bedroom provides options for separate sleeping arrangements or as a spare room for visitors. Keep up with your cooking skills in the well-appointed kitchen and enjoy the space in the open plan living room. The generous balcony is where you will be able to enjoy the breeze and watch the surrounding happenings. Portofino Hamilton has 20 two-three bedroom apartments on offer on Levels 4 and 5. The main bedroom has a generous ensuite and walk in wardrobe. The second or third bedroom provides options for separate sleeping arrangements or a place for the grandchildren to sleep when they visit. Keep up with your cooking skills in the well-appointed kitchen and enjoy the day-to-day comfort in the living room that leads on to the generous balcony which is home to the extensive views of the surrounding vistas and the Gateway Bridge.